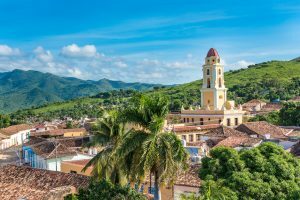 A UNESCO World Heritage site, the town of Trinidad located on the southern coast of Cuba, grew to its glory in the 1800’s during the heyday of the sugar trade. At one point in 1827, a sugar mill in Trinidad produced just under a million kilos of sugar. 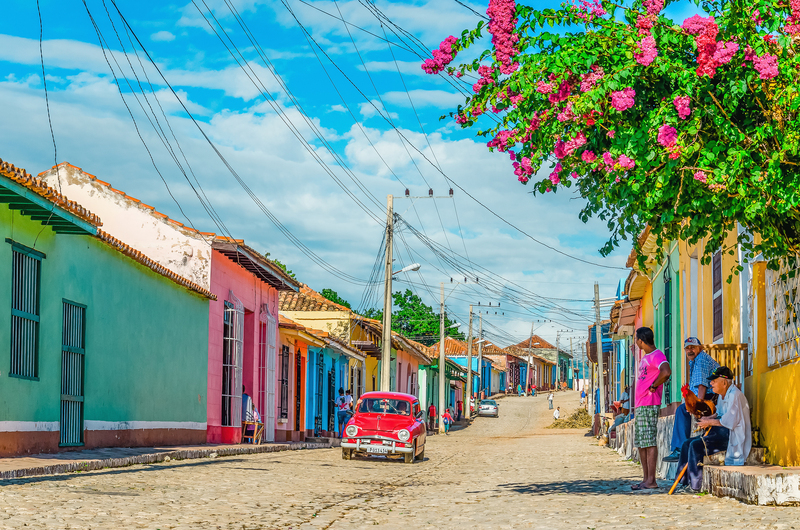 The resulting wealth of sugar plantation owners during this heyday is reflected in the streets in this town through beautiful Spanish colonial mansions, plazas and churches built during this time period. The reflection of wealth did not stop in the architecture, as those buildings were then filled with beautiful china, crystal, art, painted wall frescos, inlay, and other trappings of a wealth driven society in the Baroque Period. Outside of town, in the Agabama Valley, are the remains of the sugar mills, while nearby on the coast are beautiful white sand beaches, and lovely crystal clear waters. 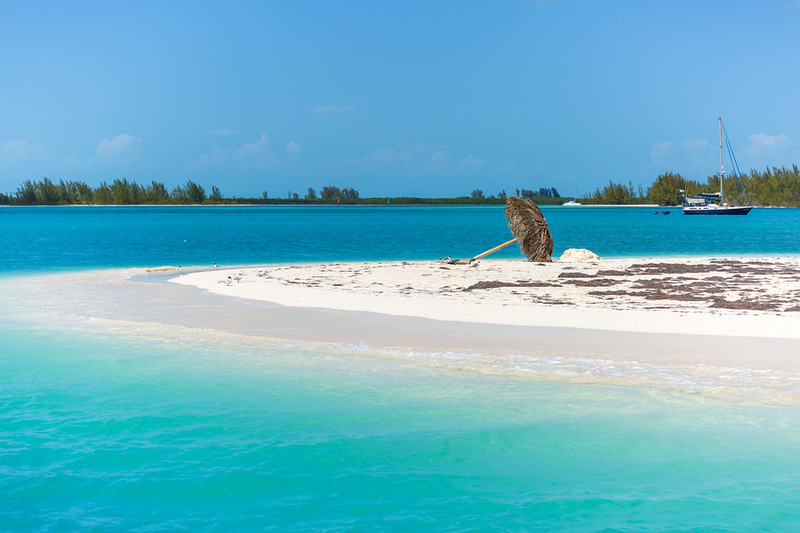 Trinidad should not be missed as a port of call on a crewed yacht charter along the southern coast of Cuba. The Plaza de Mayor, at the center of Old Town, is a lovely central plaza that is usually very lively with music and dancing; especially at night on the steps in front of the Casa de la Musica where the Plaza comes alive with salsa bands and salsa dancing. This is a great location from which to start exploring the various little cobblestoned streets of Old Town. Enjoy walking or take a horse and carriage ride to explore the streets of Trinidad. Located just off the Plaza Mayor is the Museo Historico Municipal inside the Cantero Mansion. While the exhibits could use a makeover, the information is interesting and anyone climbing to the top of the mansion bell tower is rewarded by a great view of the town. Visit the Museo Romantico in the Brunet Mansion, to see a display of fine china, furnishings and other beautiful period pieces brought to Trinidad by wealthy sugar planters in the 1800’s. In Plaza Santa Ana, is the building that once housed the prison, which today houses an art gallery, handicrafts market, pottery shop, bar and restaurant. For those interested in architecture, the Museo de Architectura Colonial may be of interest. Here and in other museums guides are available for a small fee, and tipping is always encouraged. Nearby in the Valle de los Ingenios, in Agabama Valley, also a UNESCO World Heritage site, are the remains of some 50-70 sugar mills, plantation houses, and processing buildings left to decay when the sugar profiteering era came to a halt in the early 1900’s. In the valley is the Iznaga Sugar Plantation with a still standing plantation owner’s house converted into a restaurant, and with the slave quarters now used for local housing, is Torre Iznaga, a 45 meter bell tower built by Alejo Iznaga Borrell in 1816 where the bell rang at various times each day to regulate the working day of the slaves. And from where, at the top, Borrell could stand and oversee his kingdom. Today, the tower still stands. Climb to the top of the tower, and just like Borrell, see a terrific view of the valley. Around the tower the local ladies are usually set up to sell lace and embroidered cloth items. 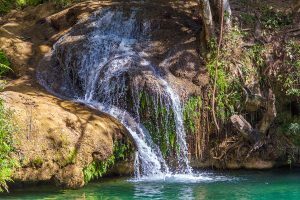 Also outside of Trinidad inland, reachable by hiking or horseback, is the Topes de Collantes, a 62 meter waterfall ending in a cool swimming hole. 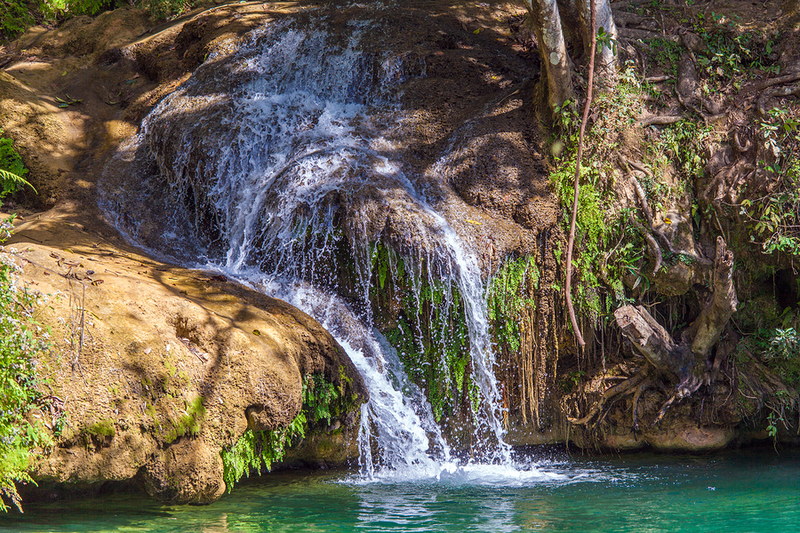 There is an entry fee collected before a 1 hour hike down to the waterfall with, after a refreshing swim in the waterfall pool, a 1.5 hour hike back on foot, horseback or donkey, up steep slopes that can be slippery. Also in the mountains are hiking trails. 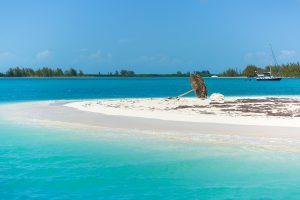 On the coast, Playa Ancon, 2.5 miles long, and only 7 miles from Trinidad, is a beautiful white sand beach that many feel is one of the finest beaches in Cuba. Trinidad is an historic once wealthy sugar trading town, locked in time in the Baroque period; framed by a beautiful beach, an historic valley filled with the remains of sugar plantations, and the Escambray Mountains inland. When on a crewed yacht charter along the southern coast of Cuba, be sure to include Trinidad in a yacht charter itinerary.